May 18, 2015 – NASA began work May 13 on a major milestone in its preparation for testing its new Space Launch System (SLS). 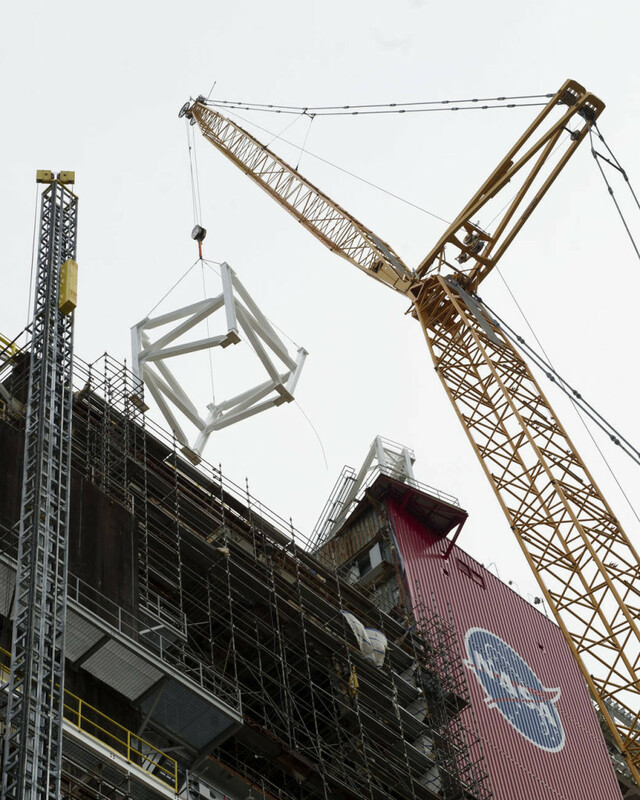 Large structural steel sections have been lifted onto the B-2 Test Stand at Stennis Space Center, which is being modified to test the SLS core stage prior to its first uncrewed flight. The SLS is being developed to return humans to deep-space missions, to an asteroid and eventually to Mars. A major step in the modification involves repositioning and extension of the test stand’s Main Propulsion Test Article (MPTA) framework, which supports the rocket stage for testing. The framework was repositioned on the stand late last summer. Now, work has begun to add the large structural steel sections that will extend its height. The existing MPTA framework, built in the late 1970s to support testing of the space shuttle MPTA, stands 61 feet high and contains about 1.2 million pounds of fabricated steel. Another 1 million pounds of structural steel is being added to accommodate the larger SLS stage. Three levels of structural steel sections will be lifted into place during the upcoming weeks; this photo shows a base section on its way into place. Once all sections are lifted and anchored in place, the MPTA framework will extend 100 feet higher, providing a decidedly new look to the Stennis skyline. SLS testing will involve installing and anchoring the core stage onto the B-2 stand and simultaneously firing its four RS-25 engines, just as will occur during its mission flight.